These clients look for any excuse to fill their big backyard with friends. Our mandate was to create a space where an entire menu for a large group could be prepared with ease. The space needed to feel elevated and modern, but look natural in the yard surrounded by greenery. This gave us the opportunity to install a warm cedar ceiling with a custom lowered wood lighting track which served as a visual feature as well as task lighting across all areas of the kitchen for evening parties. 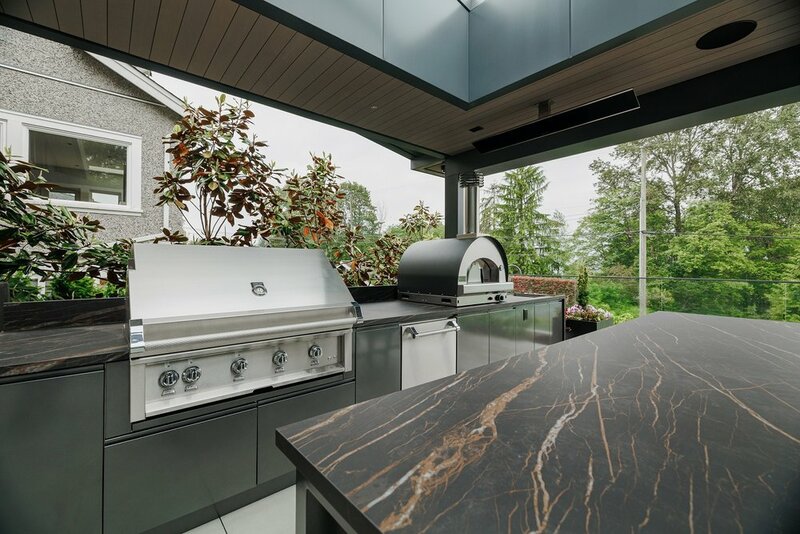 We incorporated three different ways to cook, including the largest grill on the market, the expansive 56” Alfresco grill with two rotisseries and a sear zone. To complement it we added a side burner and a 24” versa burner with a teppanyaki griddle. The generous selection of cooking ranges warranted ample prep and storage space, so we built a luxurious seven extra ft of counter space, in a rich colour mimicking a sheet of acid-washed steel. A 24” sink provided a cool zone for both food and beer, and a large 31” granite sink and commercial faucet to help aid in the cleaning up of the party army. Complete with a full-width under-counter refrigerator, this space offered every commodity a caterer could want in their backyard. So who’s coming over for Super Bowl Sunday?